Waterproof protection for your iPod®. Fits other MP3 Players as well. 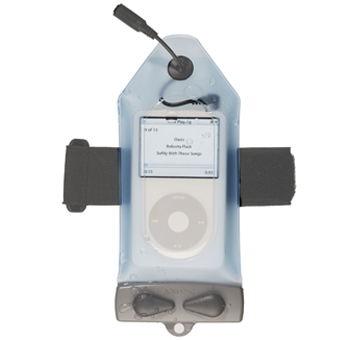 Keep your MP3 player safe from water, sand and dirt. Designed with a built-in external headphone jack for earphones, the clear front panel allows full operation of controls and click wheels whilst still inside the case. The MP3 Case will fit the majority of phones and GPS units as well. Will float with an iPod in it. A packet of re-usable, re-indicating desiccant. These will help absorb any condensation in the air inside the case.